We sell used bikes (see below for listings)! Stop in to the shop if you’d like to see these bikes in person. Looking to replace your ride? Ask us about trading in your old bike. 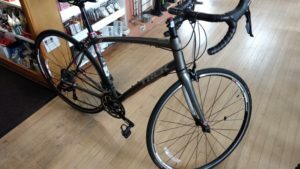 USED: $799.99 Trek Domane ALR 4 Disc 50cm normally sells for over $1600. A great way to get into road riding at an affordable price. Aimed at riders whose height is roughly between 5′ 1.8″ to 5’4.6″. 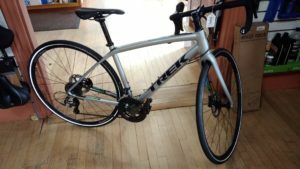 USED: $800 2015 Trek Lexa SLX 54cm Road bike, Women’s Specific Design. Featuring the isospeed decoupler (makes bumpy roads feel better :). The bike’s in mint condition and aimed at riders of heights 5’6″ to 5’9″.